Welcome to Spycoupon friends, in this thread I will update Mobikwik coupons & cashback offers of 2018 on daily basis. So whenever you see this post on home page, do understand that new promo code has been added & date in bracket will indicate expiry. Note that most of the offers will work on mobile apps only. Before proceeding further, let me introduce you to Mobikwik. After Paytm & Freecharge, Mobikwik is 3rd highest downloaded app in recharge category. It was founded in 2009 by Bipin Singh & today it is one of the biggest player in e-commerce sector. Code : PREPAY | Min spend 10 Rs | Max 200 Rs cashback. NEW50 : Spend minimum 50 Rs on recharge & get 50 cashback after transaction. FIRST50 : Add Rs 50 or more to wallet & enjoy Rs 50 cash back. Both coupons given above are valid once per user. HAPPY : 10 CB on prepaid & dth recharges worth Rs 20 or more | Valid till 9PM only. FEST120 : Minimum amount of Rs 10 is to be spent to claim offer. You heard it right! Now you can get 50 Rs per every friend who joins Mobikwik through your link & adds 100 Rs to wallet. Click here to know more about this deal. INEW100 : Using this promo code, you will get flat 100 rs cashback on adding 200 rs to wallet. OCTDTH : Get up to 5% (max 40 Rs) cashback on dth recharges above 100 Rs. Coupon code : GETITALL | Minimum recharge of Rs 10 or more is necessary | Offer can be redeemed multiple times per account. You have to do at least 1 prepaid, 1 postpaid, 1 DTH & 1 Utility bill payment by applying above code. Total transaction amount must exceed 1000 Rs to receive cashback. 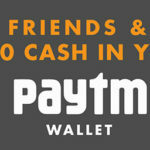 PAYBILL : get 1% cashback on minimum 100 rs transaction. You can get up to Rs 400 cashback. 1] NEW100 : Add Rs 80 ore more and get 20 Rs extra cash back. 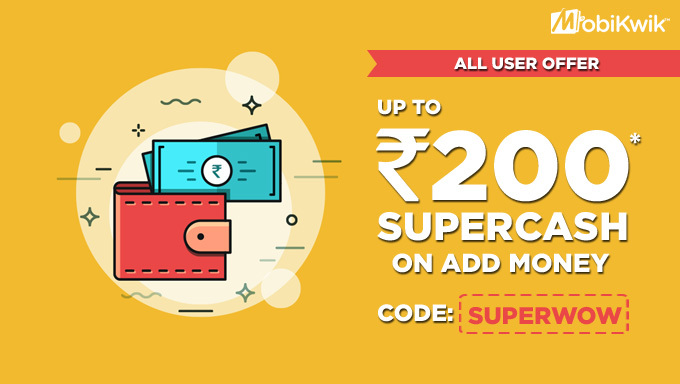 2] KWIKADD : Add minimum 10 Rs in wallet and get extra 10% back. Maximum CB is fixed at 50 Rs | New users only. POSTPAY : Win 100% cb up to 200 Rs on min spend of 50 Rs. LUCKY100 : lucky 10,000 users will get upto Rs 100 CB after using this code. FREE20 : To use this code, it is mandatory to spend minimum 200 Rs. Coupon can be used once and as usual, it’s not applicable for Airtel users. Recharge for min 10 Rs and get 25% cb. Max cashback of Rs 75 is available to claim from this offer. MAGICOF3 : Use it on your every recharge to receive upto Rs 50 CB on 3rd recharge above 500 Rs. MAGIC500 : Get 15% cb (max 75 Rs) on every 3rd transaction above 500 Rs. MAGIC : Lucky users will get 300% cashback (max 300 Rs) on recharges & bills. Mobikwik is great alternative option to Paytm, freecharge & Oxigen wallet. Here is our honest review about Mobikwik service. You can also submit your votes below. 1) Good option if you have already used all Paytm & freecharge coupon codes. 2) Exciting offers for new users including recharges & adding money to wallet. 3) Virtual wallet for easier online transactions at 100+ merchants. 1) They don’t provide coupons very often. 2) Most of the offers are limited to New Users, old customers rarely get good deals. You’re bit late because add money offer was live on 5th September. Keep checking this post, we may add it soon. Thanks Admin, now I’m getting the cashback regularly. Do update us like this. Please start an app to do so. All the best. Hey Sandip, thanks for the complement. I will definitely think over it. Thanks admin, yesterday MOBIJULY10 was not working but today it’s working fine. Hi admin I tried adding 800 rs using MOBIJUNE12 but it is showing maximum coupon redeem limit reached. Now we have added similar offer with 10% cashback. Sorry for late reply. Bhaiya,your site is awesome. Can you please give me your whatsapp no so that I can directly contact you? Can u please tell me, why I am unable to redeem code MOBIJUNE12 TWICE WITH A DIFFERENT DEBIT CARD? You might have used it on one of your account twice. 1. Ho Sakta Hai ki tumh Ekk hi account saii transaction Kar Rahe ho. 2. Tumh Ek hai Mobile Saii Transaction Kar Rahe ho iss liye. Kiuke Mobikwik me Sirf ekbar ek Account , ek debit card se Cashback Mil sakta hai ( 50- 50 cash back). Thanks for your valuable coupons. I would like to get update whenever every coupon is added; especially for mobikwik and freecharge. Since we do not create separate thread for each coupon, it is not possible to notify them via email. But still we are trying for it. Please check out homepage everyday as we daily update new promo codes. Please suggest any offers for windows phone…i have almost used all mobikwik freecharge and Paytm offers posted by you and thanks a lot for those. If you are having Lumia 640 then use following code : Apply coupon MOBILUMIA after adding 200 Rs to wallet and get 200 Rs cashback. Is there any mobile recharge offer for old users? Hey dear, keep watching this thread. You just missed 10% cashback offer today! AAP15 and SOFMARCH2015 Shows invalid coupon. Please read the terms carefully. They will work only on 17th March. Goto reload.in and use coupon DTH50 to get 50 cashback on 250 rs. Hey @admin I m unable to login my account, it says write to mywallet@mobiwiki.com but they didn’t reply me? Do you know what should I do? Just goto mobikwik official Facebook page and write your query in comment. Else, you can send them personal message. Their social media team is always active. Any new cash back offers for Data card recharges amounting to 650 and above? For that, you will have to change device Id. And I won’t suggest you to do so! Any coupon for the new and existing user on cash back to add in wallet? For new users: use ENTERMOBI to get 50 cashback on 50 Rs. k then tell me how much amount i have to add to my wallet, and also tell me the promo code for to redeem my money. Mobikwik doesn’t give cashback on recharges. Rather, you have to add some money to your wallet and then redeem promo code. Hence, cashback will be again added to wallet. You can also go for the offers I mentioned above. 1) Groupon 101 Rs cashback on 101 recharge. 2) ENTERMOBI to get 50 cashback on 50. It’s once per user/device. Take new device with new mobikwik account and you will get this offer again! your promocodes are working too good really working. Thanks RK for your valuable comment. We will keep on updating all the latest promo codes. Stay Connected.. Sorry for late reply.. I think this coupon has expired..
Is ENTERMOBI code is working for old user also? Yes..but for today only (as per mobikwik). Dear admin, ENTERMOBI Christmas offer 50rs is not working what to do. Its a Mobikwik official offer valid once per user. Please tell me what error it’s showing..
Plz guide us by screen shot. how to use promo code. No promo code required for that offer. If offer has expired, then you won’t get it. It’s only for new users of mobikwik. I think promo code has expired. Plz guide us by screen shot, how to enter Mobikwik Promo code. app40 code not working. I can’t understand how to redeem any code. Dear admin, i am very shocked how yo is thereu people get the codes ? Is there any code of mobikwik for new users ?? I’m not confirmed but GET20MORE is still live for new users (not sure). thanks for your valuable coupons. I would like to get upated whenever every coupons added; especially for mobikwik and freecharge. Thank you Dhanesh, I can create separate post for each coupon but it’s bad practice for SEO (search engine optimization) and Google take it as spam. So whenever I update coupons, you will find this post on home page. 100rs cashback for south Indian ursers. I did 50rs to my linked mobile number. But today I didn’t get my cashback war to do Admin. Just wait for today Dhivyan, they have clearly said that cashback will be processed on 8 December. Welcome man! Expiry is not known, so better to use it today only..